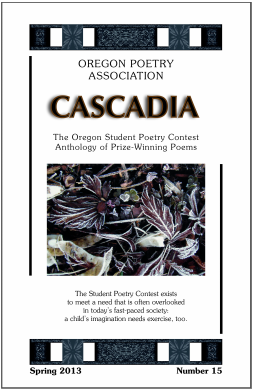 Cascadia is the anthology of winning poems of the Oregon Student Poetry Contest. Sponsored by the Oregon Poetry Association (OPA) and published annually, the 40 winning poems are selected in four divisions of K-12 school student entries from all across the state. Division I: Kindergarten-Grade 2; Division II: Grades 3-5; Division III: Grades 6-8; Division IV: Grades 9-12. Each division has 1st, 2nd and 3rd place winners and 7 honorable mentions. All 40 winning poets are published in the book. As a member of OPA, C. Steven Blue volunteered his publishing and editing services in 2013 for Volume 15, which was acknowledged as being the finest published volume to date.